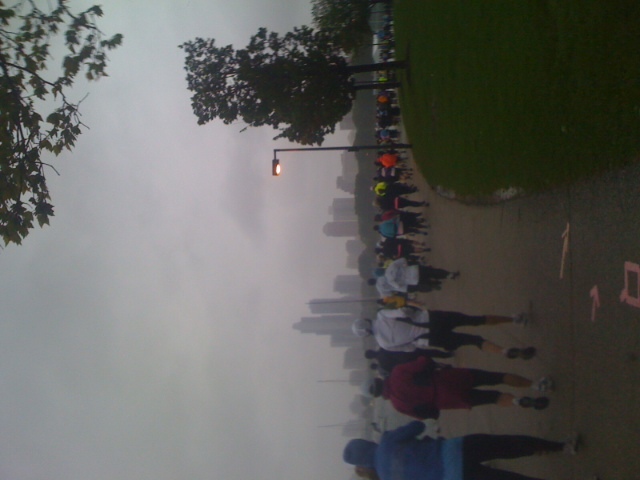 When I signed up for the Magellan Chicago Spring Half Marathon, I thought “A run in mid-May along the lakefront sounds lovely.” When I woke Sunday morning to temperatures in the low forties and rain driven by 20-mile-per-hour winds, “lovely” was not the word that came to mind. I’m a fair weather runner. I always have been. I won’t run if it’s too cold. I won’t run if it’s too hot. Sometimes I’ll run in rain, but only if it’s a calm drizzle on a warm day. So when I looked out the window to see gray skies and wind-driven rain, I wasn’t happy. It looked awful out there. In fact, it looked like the perfect day to crawl back in bed. But, alas, I had publicly declared I was doing the race and therefore felt compelled to go through with it. As I walked towards the start through the wind and driving rain, I vowed to never again announce my race intentions. The weather put a damper on the pre-race buzz. Instead of cheering and whooping while waiting for the start, runners stood huddled together, pulling their hats low over their eyes. Several people had covered themselves in plastic garbage bags in order to stay dry. I wished I’d thought of that. I stood elbow to elbow with other runners, wishing I had a little more room to stretch. Fortunately, I had a secret weapon: a lingering cold that had settled in my chest, leaving me with a deep, sharp cough, the kind that makes people in public areas move farther away. I was no longer contagious, but as I stood shivering at the start, hacking away, I realized I sounded like Typhoid Mary bent on spreading destruction. People gave me a wide berth. Soon I had plenty of room, in spite of the crowd. Having been stuck in gear check for what seemed like eternity, I was too far from the start line to hear any of the announcements. I don’t even know if they played “Start Me Up” as the gun went off. 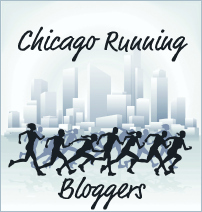 But eventually the crowd oozed forward and we crossed the start mat, turning onto the lakefront path. The wind hit me full force. I looked out to see Lake Michigan churning, with large waves crashing into the concrete sea wall. Not exactly a nice day for a jog. As we started, I was amazed at how many people had braved the elements, and not just the contenders who had a shot at winning. The crowd was full of mid- and back-of-the-pack runners. As we got underway I realized there were several walkers. I wasn’t happy about running in such conditions, but walking the course would take twice as long, something that sounded like a miserable proposition. And yet, there they were, making the best of it. What’s more, I saw at least one person running with an artificial leg, and I believe one person was visually impaired, running with a guide. Suddenly, my hardships of having to get up early and deal with a little wind seemed inconsequential. Surprisingly, within a few minutes, everyone was in a good mood, in spite of the weather. I smiled as I saw the running juggler pass by. There were runners of all types, from the semi-pros decked in technical fabrics and high-end accessories to the guys loping along in baggy gray sweatpants. We all merged together like a school of fish, following the path around the Shedd. I thought about all the races I’ve done on that stretch.. It was like a trip down bad-memory lane: there’s the spot where I wanted to quit the CARA 20-miler, up there is where I almost twisted my ankle in the Hot Chocolate race, this is where I thought I was going to die during the Chicago Triathlon. The course was an out-and-back route, and yes, some people turned back early, but most kept going, even the walkers. What’s more, I was shocked to see spectators on the course, cheering in the rain. Around Mile 2, I passed a woman standing by herself, bundled up in her blue winter parka, applauding us as we went by. Was she waiting for someone in particular? She wasn’t holding a sign, so it was hard to tell. She just stood there, alone, clapping incessantly and smiling. As we went along, I thought “Well this really isn’t that bad.” Once I was soaked through, a little more rain didn’t bother me. Then we made the turn back north. The wind. Oh, the wind! It was blowing hats right off people’s heads. Waves smashing in from Lake Michigan launched spray towards us, as if we weren’t drenched enough already. Runners nearby debated whether it was more like something from The Perfect Storm or White Squall. I put some of my cycling knowledge to use and looked for big guys to draft behind. I found one, a tall hulk of a man, but he was running too fast for me. I kept up as best I could, but soon dropped off. I then came upon a large guy wearing a bright yellow shirt and tucked in behind him. Unfortunately, he was going to slow for me. I stayed with him for a while, since I wasn’t concerned about my time and mainly just wanted a break from the wind, but eventually I moved on. As I headed back north, I was surprised at how many runners and walkers were still coming the other way. Talk about dedication. What’s more, as I got closer to the finish, I saw that the lone clapping lady was still there, wrapped in her blue parka, smiling and clapping. A dedicated good friend, braving the elements as a demonstration of affection? Or a slightly insane person on a weekend leave from an institution? We’ll never know. Finally, I made the turn away from the breezy lake and crossed the finish line. Dare I say it was kind of fun? Fun in a ridiculous way. As fun as anything can be when you are soaked to the bone and have rain dripping off your nose and you’re coughing so hard you think parts of your insides are going to fly out. Yup, that’s why I do these things. Because they’re fun. Hey you got it done. That was a really crappy day. They should’ve given you guys two medals! Just like happiness, I guess, “fun” comes in many different colors. I loved the clapping lady, the juggling runner, the school of fish — and I’ll never think of running in quite the same way again.